Hi, I am interested in your 1946 Ford Super Deluxe (stock #5134-CHA) listed on Autotrader for $42,995. I'd like to get more information about this vehicle and confirm its availability. 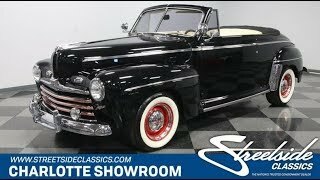 At first glance, you see the icon that Is the 1946 Ford Super Deluxe Convertible. But as you dig deeper, youll discover a full custom-built machine that has a ton of upgrades, including the enhanced small block power, a custom leather interior, and an overdrive transmission. So take a long look at one of the coolest convertibles around. Large fenders, full-length trim, dual spotlights, running boards, whitewall tires this one really knows how to make sure people recognize the icon that is the 46 Ford. We really love when this is finished in a nice glossy black. The luster of the paint does a great job of highlighting the curves in the well-kept sheetmetal. Plus, the black is a nice background for all the chrome and stainless that makes this such a recognizable classic. Youll even love the thoughtful coordination, like how the red detail in the grille match the red wheels with two-piece beauty rings. But this is more than just a well-done 40s cruiser. A few clues like the lowered stance and bright dual exhaust tips signal that this has been given some extra attitude. While the black folding roof gives this a coupe-like look, what we really love is taking it down to reveal the distinct cream leather interior. Theres plenty of room for family and friends, so youll be glad there are also upgrades to keep them happy like an AM/FM/CD stereo. As you slip into the drivers seat, you get the immediate feeling of being upgraded. Not only is the leather a superior seat material to the original Ford, but also you get better bolstering and a fold-down center armrest. Theres a classic banjo-style steering wheel, but its a smaller diameter on a tilt column with power steering. And while you still have the cool art deco style dash, there are crisp VDO auxiliary gauges nicely integrated so you can keep a better eye on whats going on under the hood. One look at the engine bay, and you know this has been given a nice upgrade, too. Ford flathead power has been swapped for a Chevy small block. This 350 cubic-inch crate motor is great for upgrading, thats why it has a full Edelbrock package with the four-barrel carburetor, intake, polished valve covers, and matching air topper. More than just an upgraded powerplant, this custom build was built to be driven. You have great supporting components like an HEI ignition and a Griffin aluminum radiator. Plus, the transmission was upgraded to a 700R4 four-speed automatic, so you have overdrive comfort. As you look underneath the car, you see a clean and painted setup that highlights upgrades like the independent front suspension, updated rear end, and front disc brakes. Even those iconic whitewall tires are masking modern treads. This is the cool classic Ford that has been given all the right upgrades to keep it a great anytime cruiser. A total package like this doesnt come along very often. Call now!